The euphoria of being your own boss dissipates when you realize that you are also your own secretary, receptionist, publicist, marketer, human resources director, accountant, etc. When you work for a corporation, all these things are handled for you. It’s more overwhelming than you could have imagined, and your dream of spending more time with your friends dissipates with your entrepreneurial euphoria. Solution – Outsource small tasks or hire a virtual assistant. As you become more successful, you will have to work even harder, putting in more hours, getting less sleep, spending less time with the family, and spending more time worrying about your business decisions. Your time is spent in front of the PC, opting for a sandwich at noon and a hurried, litany-laden dinner at night. Then it’s back to the office for more calls and emails. The next morning, you are back at the computer by seven and the cycle begins again. This is not what you thought it would be. Solution – Set and acknowledge a quitting time. There will always be more you can do. Don’t postpone your life. When you work at an office, you shut down everything at five and go home to a totally different environment. Now, your work is at home. Even if you just have a laptop in the family room, you will be checking your emails, calling clients or freelancers, and writing blog posts. Your mind doesn’t shut down either; it’s always mulling over what you did or didn’t do today, and what you have to do tomorrow. 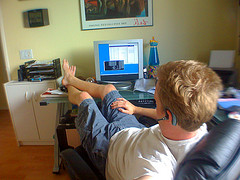 Solution – Get up in the morning, eat breakfast, take a shower, and get dressed for “work” before you get on your computer. Then put change into your pajamas when you’re done. Have your parents ever told you to “get a real job”? They come home from work and have no idea how hard you’ve been working. Since you’ve been home all day, they assume you’ve just been watching TV and playing Call of Duty. When in reality, you’ve been working just as hard as your parents and will continue to work well past their bedtime. Solution – Explain what you do all day to your parents. Your home is designed to be distracting. It’s meant to be a place where you can relax and occupy your time with fun activities. Trying to work at home is like trying to make an important phone call at a concert. Every time you lose your focus, it could take 20 minutes before you gain it back again. Solution – Establish a dedicated workspace. Three of the world’s top 25 brands started in a garage. It can be done. If you know what to expect, what NOT to do and how to avoid the pitfalls of running a home based business, you’re more likely to be successful. Which Three Big Name Brands Started in a Garage?